l'm hooked on Robert Oster inks, and I'm having a lot of fun playing with some of the recent new releases. I first saw Eucalyptus Leaf on @robertostersignature's Instagram feed on May 12. This ink reminds me of the 70's green shag carpet. I purchased my bottle of ink from Pen Chalet. The bottle is 50 ml of ink. Eucalyptus Leaf is a medium green. It has a tiny bit of black sheen when really concentrated, and has medium shading. Seasonally, I would use it in the spring. This ink looks so much darker in a large swab on Tomoe River paper. The ink drops really show off the shading this ink is capable of. It ranges from a light green to a dark evergreen color. The ink drops make it look like there is just a little bit of black sheen, but you only see it in large swabs on Tomoe River. Feathering: Eucalyptus Leaf had no feathering on any of the papers. Bleeding: Eucalyptus Leaf only bled a little bit on Tomoe River on the larger swabs. Ghosting: Eucalyptus Leaf had low ghosting on Rhodia and Baron Fig paper, and medium shading on Tomoe River and Leuchtturm paper. Shading: Eucalyptus Leaf had medium shading on all of the papers. I especially enjoyed the shading on Tomoe River paper. The only sheen I saw was in the huge swabs on Tomoe River paper. Left to right: Robert Oster Verde de Rio (I used a sample for this swab, and then ran out of ink, so I don't have enough for a review, but I will get a bottle to review eventually), Robert Oster Eucalyptus Leaf, and Robert Oster River of Fire. Verde de Rio is lighter than Eucalyptus leaf, and a bit more yellow. River of Fire is more blue-green, and has a lot more sheen. Left to right: Diamine Evergreen, Diamine Emerald, and Sailor Jentle Epinard. 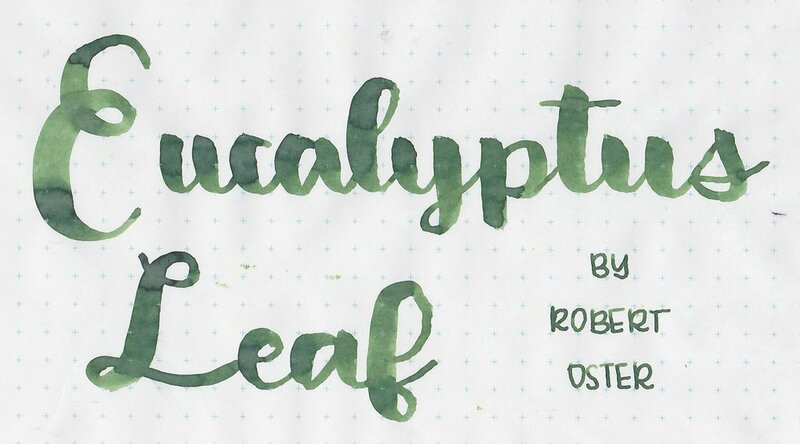 I think Diamine Emerald is the closest to Eucalyptus Leaf, but it is lighter. Overall, I love the shading this ink has, but a lot of the Robert Oster inks have great shading. The flow is on the wetter side of the Robert Oster inks, which I love. The color isn't my favorite of his greens, but it is a good spring dark green. I think it falls in the "boutique" range of inks, instead of the classics, due to the shading. Give it a try-you might love it. Disclaimer: I purchased this ink myself, and all photos and opinions are my own. There are no affiliate links in this post.